Contains a photo of every MLS player (except two) and coach in the league's history, who have played at least one meaningful game. Many thanks to everyone who helped me find some of the more obscure players, including all those on Bigsoccer and Dan of Metrofanatic. Enjoy. CORRECTIONS: The pictures of Chris Brunt and Washington Rodriguez are of the wrong people. Here are the real MLS players. I've updated the download links with these photos replacing the previous ones. Yay, another first place ranking New York fans can be embarrassed about. The expansion teams will obviously rank lower here, except for Chivas which has their own "source" of players. The league's two most successful franchises are at the top. New York is an interesting case because they have brought in so many failures. See their rank in the next category. Assistant to the Interim Manager? That's what Peter Nowak is leaving DC United for? To be Bob Bradley's assistant? That seems like a big step down to me. Why would you leave the best team in the league to play second fiddle to a guy you outperformed over the past three years? Could you imagine that scenario in any other league than MLS? Hopefully (for his sake) he has something lined up in Europe. So that's two MLS coaches gone for the national team. I guess it's likely that Bradley will end up being that coach over the entire next cycle. After all, why would you leave your club just to be an interim coach for six months (he couldn't do both?) ? That's just great. So in 2010 we'll make the round of 16 if we're lucky, get eliminated, and be right back where we are now. So the failure to get Klinsmann or Pekerman not only is a lost opportunity, but now it hurts MLS as well. Great. And of course, you can't get good foreign coaches to replace Bradley or Nowak, because they're not familiar with the league's system of drafting, allocations, and playoffs. Not that they're worth it, because it doesn't matter how you do for 90% of the season anyway. I'm posting less now that it's the offseason, and I thought I would summarize my thoughts on all the pressing soccer issues in one post. This is incredibly disappointing. Not because he's a bad coach, it's just that there's no way he will be able to bring something highly different to the table. We need a foreign coach to do that, someone with experience at the highest levels of the game. Why? Because, the goal is to win the World Cup. I think all Americans realize that there's virtually no way we can possibly win the 2010 World Cup, due to the fact that the players we have now are not good enough. Incidentally, that's why everyone goes crazy over every young kid and wants them capped, because we already know what the veterans can do (and it's not good enough). So if our players aren't good enough to win it, the only super slim chance we have is to have a brilliant coach like Otto Rehhagel with Greece. Bradley is not going to be that guy. Why not hire someone who will bring in a different way of thinking? MLS (and the popularity of soccer) will not succeed or fail based on the national team results. The national team coach doesn't need to do any developing of players, so even if it fails miserably it's not going to set us back as a soccer playing nation. Bradley is more of the same and that does nothing for us. He's not even the best choice in MLS (Peter Nowak anyone?). This is a good trade for all parties. First, Adu can easily do Andy Williams' job. RSL's defensive needs are far more pressing, but this and the signing of Luis Tejada should make them better. Nick Rimando should be an improvement over Scott Garlick as well. And of course, the media attention is a big part of this. RSL needs to do something after two bad years, and they have to finally get the stadium built. Also, the Utah Jazz are having an outstanding season, their first good one since RSL came into existence. They also gave up a major allocation, but given their track record they had a good chance of messing it up anyway. Now they need to sign a defender. DC didn't need Adu, and now they can sign a good player from South America. As for Freddy himself, he finally gets to run the show with an MLS team. He probably should've been traded after last year. While he probably wasn't ready to start before, given the relative meaninglessness of the regular season, why not? I expect him to do well, though. As Grant Wahl mentions, it seems like given how Dempsey's transfer is playing out, Adu will be here for the entire 2007 season. I don't agree when he says that DC comes out better though, especially when you take into account the off the field stuff. As the Salt Lake Tribune reported, some info was released coincidentally at the same time the Adu trade broke (yeah right). The article says that "RSL averaged nearly 10,000 in paid attendance its first two seasons at the University of Utah's Rice-Eccles Stadium." Nearly appears to mean that it was actually less than 10,000, which directly contradicts the numbers leaked to the San Diego Tribune during the Summer. There, the 2005 paid attendance was listed at 12,689 although 18,037 was announced. So that means that either the 2006 season was much worse for the team (unlikely), or that the previous number was wrong (probably). Or RSL is lying, but they would be stupid to lie if they really want the stadium. Anyway, does that mean that all the San Diego article numbers are wrong? There's no way to know. There's also the possibility that the Salt Lake Tribune reported something wrong, but in summary it seems like RSL is doing worse than previously thought. I should mention that 10,000 paid would still put them in the top half of the league, and is ultimately meaningless as long as the stadium is built. There's also an AP article with more stuff. Is a couple of degrees really that bad? With small stadiums, you should expect a sellout anyway. That to me is probably the most disturbing thing. Why change the SSS only policy (if there was one) now? Sure, DC is a great soccer city, but it's a freaking baseball stadium with a covered up infield. So the quality of the field and the overall soccer experience will be less. How can they effectively sell stadiums if they don't hold their championship match in one? After a great year, looks like a bit of the "old MLS" has reared its ugly head. MLS execs must be thinking about the big crowds in the pre-SSS days. But with all the money that's pouring into the league, they really don't need it. Forget the money, I'll take 20,000 fans in a real soccer stadium over 60,000 in RFK anyday. The improved appearance on tv is well worth the loss of revenue. The only reason this decision makes any sense is if you consider geography. The last MLS Cup on the East coast was in 2002. So if that's the reason, then I guess I can live with that. I'll leave the fond memories and tributes to others, but I just want to point out the differences in the Kansas City Star and Dallas Morning News articles today. I know he owned the Chiefs, but he also owned the Wizards until recently. So you would think that the KC Star would have more than a sentence or two about the Wizards. There's also very little about tennis or any of the soccer stuff, and the timeline at the bottom is missing so many important milestones, they should've left it out completely. No mention of his love of the World Cup either. The Dallas article does a much better job at encompassing everything that he did, and is also written more beautifully. Great job. This past week we've taken a look at the year by year rankings for offenses and defenses in MLS. Looking a little more closely, I've made a list of which teams were truly great or horrible based just on those rankings. The following lists are those teams which were in the top or bottom three in both offense and defense. The 2002 Galaxy are the only champions to be ranked in the top three in both categories. It's interesting also to see which teams make it on here and which are left out. Both of the Earthquakes' triumphs miss out, and yet the 2002 team makes it? 1999 for the Fire? The worst team on here is the 1997 Dallas Burn, who actually had a losing record (13-14-5 w/no shootouts). Thanks again to the 2006 Rapids, who showed us how unfair the MLS playoff system is. Teams like that don't deserve to be one game away from the championship. I don't believe any of the others here advanced past the first round of the playoffs. The Wizards' championship was surrounded by two horrible years, although they did make the playoffs in 2001. Actually, they only finished two games under .500 that year, but still had a -20 goal differential. The worst goal differential to make the playoffs is Miami 1998 (-22). The best team on this list was the 2000 Rapids. The host's spot (South Africa) will NOT count as part of the CAF's (Africa) five spots. This is very interesting, because I always assumed that this should be the way it's done. However, with the places changing every time you could never tell for sure exactly if that was the case or not. I know that the in the 1994 qualifying, CONCACAF only got one spot because the USA hosted. They previously had two in 1990. But I used to play Championship/Football Manager, and they similarly took the host's spot out of the regular places. Not that they were perfectly accurate. Seems it varies from tourney to tourney. For example, in the 2005 U17 World Cup, only two CONMEBOL teams qualified along with Peru as hosts. Same for Finland in the 2003 edition. But that's changed for 2007 (partly due to an increase in teams from 16 to 24). This change is the correct thing to do for all worldwide international tournaments. The host's place should be separate. The other big change is that now CONCACAF's fourth place team will play CONMEBOL's fifth place team in the playoffs. 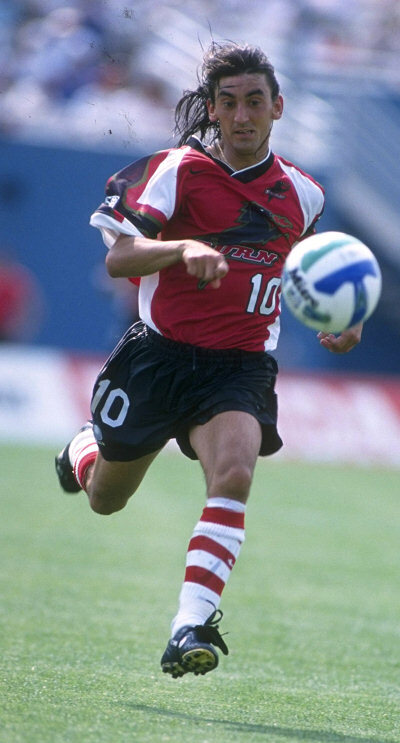 Last time CONCACAF played AFC (Asia); the matchup was Trinidad vs Bahrain. This also makes complete sense, and was entirely predictable. For those who don't remember, originally OFC (Oceania) was given their own full spot in the 2006 World Cup, leaving CONMEBOL with only four. As the only confederations with half spots, that's why CONCACAF and AFC were matched up. It was only later that half a place was taken from OFC and given to CONMEBOL, creating another playoff. Actually, it's moot because now the OFC champion will compete in the AFC's final round. It's scary that FIFA is making such good decisions. Last time AFC's final round consisted of eight teams; with the addition of Australia and the OFC champion it makes sense to go to ten. That's what I'm predicting. New Zealand should be able to hold their own against teams like Bahrain and Uzbekistan, although they probably don't have enough talent to make it. There have been a total of 49 head coaches in MLS, including interim. Including all competitions (not just the regular season) through 2006, which ones have done the best? 29/49 meet the 50 game requirement, while everyone else has 36 or fewer. The bottom three are Ivo Wortman (1.11), Alfonso Mondelo (1.06), and John Ellinger (0.93). Also, there's a really interesting stat about MLS coaches that I read a while ago. I believe it was on Bigsoccer, from Numerista (EDIT: It was actually by ChrisE, and here's the thread)? Using regular season records only, they determined that no MLS coach has done better with their second team than with the first. That was from at least a year ago, so I double checked it myself, and it turns out that Fernando Clavijo is the only guy for whom that's not the case (1.20 vs 1.34). He still has a losing record for both teams though.